Diverse Voices in Docs (DVID) 2014 Graduation - Save the date! We are proud to celebrate the success of the 2014 Diverse Voices in Documentary (DVID) program with the announcement that the Academy of Motion Pictures Arts and Sciences has increased their grant award to $10,000 for the 2015 year. DVID, a collaboration between Kartemquin Films and the Community Film Workshop of Chicago, recently completed its second year providing six months of mentorship and training to documentary filmmakers of color. The Academy of Motion Picture Arts & Sciences has been a funder of the program since 2012. Other supporters of DVID include the Seabury Foundation, KatLei Productions, and Voqal Fund. DVID strives to create a network for filmmakers of color to collaborate and support each other's careers, promote films by filmmakers of color, and diversify the documentary field. The 2014 DVID program saw 19 fellows grow their projects over six months of workshops, and introduced a mentorship program that paired established Kartemquin producers and associates with interested participants. The 2014 Diverse Voices in Documentary Graduation will be Sunday, October 5th at the University of Chicago's Logan Arts Center - 915 E. 60th St from 6-9pm! Please save the date! DVID Graduation is a special evening where all our 2014 DVID participants are honored and celebrated, and will include 3 minute clips from each project, a special guest, and a dessert reception. It also marks the opening of applications for DVID 2015. There will be more info forthcoming on exact schedule and special guest info. Please take a moment to review our 2014 DVID fellows listed below. They are an exceptional group of talented storytellers, and we look forward to the continued success of their projects. The 2014 Diverse Voices in Documentary program is made possible by generous support from Kartemquin Films, Kat Lei Productions, Community Film Workshop, The Seabury Foundation, The Academy of Motion Pictures Arts and Sciences, and Voqal Fund. Special thanks to the University of Chicago Reva and David Logan Center for the Arts for their generous donation of event space. 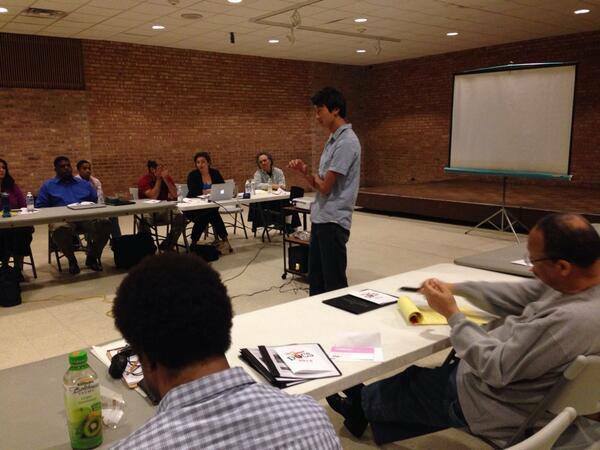 Photo: Bing Liu pitches Minding the Gap to potential funders at 2014 DVID Session 6.